Cracked heels also known as heel fissures or skin fissures are cracks that occur in the back of the heel, usually on both heels. For some people this can be a chronic problem, which is more annoying than dangerous. However, for some people such as diabetics, people with poor circulation and people with immunosuppressant diseases this problem can have major consequences. At times, the cracks can be very painful. Skin fissures can occur in most parts of the body, but they are most common on the feet and the hands, primarily, the fingers. backless shoes- Over the years I have seen this condition to be more prevalent in heavier people and those that wear backless shoes. Regular shoes that have a back to them keep the heel ‘cupped’, in other words the skin and fat of the heel area is pushed together. When you wear a backless shoe all the body fat and skin is displaced laterally and it tends to become callused and since callused skin is not healthy skin, it will begin to crack and the heel fissure will form. obesity-obviously, the heavier you are the more the heel fat and skin is displaced laterally even if you wear shoes with a back to them. This puts pressure on the skin to break open. Below to the left is a picture of a severe case of heel fissures secondary to excessively dry callused skin. To the right is simple heel fissuring. So what is the big deal about cracked heel fissures? The plot further thickens because these heel fissures are very prone to becoming infected. Once they become infected they become even more tender, they start draining and the surrounding area becomes red. (cellulitis). It does not take a great leap of faith to see how easily this can occur. The foot is usually subject to dirtier surrounding environments than the rest of the body and bacteria can easily invade these fissures. In an otherwise healthy individual this problem can be easily remedied. But as stated earlier, in a diabetic or someone with poor circulation to the feet or someone suffering from any disease state, which increases their susceptibility to infection, this minor problem becomes a major problem. Why, because in those situations the body is not able to heal the infection and that can have gross consequences. Skin fissures may also be seen on other parts of the feet. Typically skin fissures on the foot will appear in areas of dry skin, deeply callused skin and areas of skin infections such as athletes foot and eczema. The most common locations for skin fissures on the feet include a callused bunion joint, calluses on the bottom of the big toe and calluses or skin infections at the ends of the toes. A bleeding skin fissure, many times, is the first indicator to a patient that they have something "wrong" with their foot. A condition a lot of podiatrists see is a skin fissure underneath one of the toes, where the toe meets the foot. Typically, it will be seen mainly under the fifth toe, but on occasion it may also appear under the fourth toe. This type of skin fissure is usually the result of athletes foot on the crease of the toe. Typically, a patient will present complaining of severe pain under the toe for no apparent reason; it will hurt more as they walk, primarily because as the toe bends up during gait, the motion "stretches" the skin fissure and it begins to hurt. In these instances, not only do we have to clear up any athletes foot, but we have to hydrate the skin fissure so that it will close and more importantly not develop a secondary bacterial infection. Typically, I will have the patient use Bacitracin twice a day, rubbing it well into the skin fissure and insist they wear a more rigid shoe so that the toe is not forced to bend upwards. The condition will usually dramatically improve within a few days. Athletes foot What many people, who have chronic dry heels with or without fissuring, do not know is the fact that it is being caused by athletes foot. The dry scaliness of athletes foot will promote skin fissures. Ever wonder why you are putting a ton of dry skin lotion on your feet and the heels never clear up? That is one reason. For that reason I generally recommend an emollient and an antifungal cream mixed together and applied twice a day usually for 3-4 weeks. For more resistant cases I might even use an oral antifungal agent. The important thing to remember is that you can usually control athletes foot, but it can be very hard to cure. Another scenario that I see is people who wear work boots all day long with their feet perspiring. Generally, these people will throw the boots into the closet, only to wear them the following day. If athletes foot is part of the problem causing fissuring then it is important that the boots be allowed to "air" out at night either by being placed by an open window, or on the back porch, etc. in order for air to get inside the boots. Manual removal of heel callus If your heels look anything remotely like the picture above it is mandatory that the callus be removed otherwise the fissures will never resolve. A foot specialist should be called upon to debride the callus. You should never attempt ‘bathroom’ surgery as in most cases you will not come close to removing the necessary dead tissue and you will probably make matters worse. Keratolytic agent If the callus is so severe that even debriding the growth cannot rid the foot of the callus, I usually will recommend a keratolytic agent, or a cracked heel cream, for the patient to apply at bed time and then cover the heel with plastic bags covered with loose socks in an effort to moisturize the area to allow for better penetration of the medication. A keratolytic agent actually helps "dissolve" the hard skin. My favorite type of cream is one that contains urea as it will "dissolve" the very hard dry skin. There is over the counter products containing urea, but prescription urea is of a stronger concentration. Some people have very sensitive skin and unfortunately most creams and emollients are made from petroleum by products and have many synthetic ingredients added to them to change the smell or consistency of the cream. For those of you in that category, one option is to try all natural shea butter. This compound has been around for centuries and is very effective. By reducing the size of the callused tissue you are also reducing the depth of the fissure and that will make them feel better and easier to close. Some doctors even go so far as to recommend Crazy glue to glue the fissure shut in an effort to reduce pain. I am not a big fan of that because if the fissure happens to be infected, even mildly, you will essentially be gluing the infection into the skin and it will worsen dramatically. Infected heel fissures If the fissures are infected that has to be addressed as well. For mild infections topical ointments like bacitracin ointment applied twice a day with a dressing is helpful. I recommend you take a q-tip and ‘work’ the medication into the fissure itself because since bacitracin is an ointment it will also help to soften the area. Oral antibiotics For more severe infections or in people at risk, sometimes oral antibiotics are necessary. Keep in mind that soaking your feet in Epsom salt or boric acid will only make matters worse since salts tend to dry out skin. The other point to come away with here is that in most cases these are chronic conditions. Using the advice given above you can dramatically improve on them, but you will always have to be cognizant of the problem and deal with it on some type of regular basis. For those of you who have severe heel cracking similar to the photos in this article I would like to recommend the following product. A pair of night time socks + a super hydrating cream containing among other ingredients, 25% urea cream which is the strongest amount of urea that can be purchased without a prescription. You simply apply the cream to your heels, before bed, then put on the socks which keeps the cream in place and allows for maximum hydration into your heel. The following morning, wash off the remaining cream. When bathing, while the heels are soft, take the pumice stone, which is included in your purchase and rub away the loosened dry skin. Consider trying one of these plastic heel cups for your chronic dry or fissured heels. 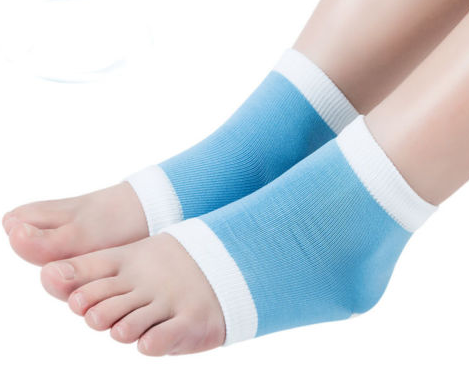 Use of these heel cups keeps all the fat underneath the heel and does not allow it to expand laterally and thus will not allow the skin to dry out and crack. You may wear it directly against the heel or you may place it over your socks or stockings, whichever is more comfortable. Additionally, you may use these with or without softening lotion. The heel cup will conform to your heel shape after you have worn it for a short period of time.